I have always been intrigued by Montessori materials, such as the Montessori sound cylinders. These sound cylinders are meant to exercise a child's auditory sense, which is important in music. And, as a piano teacher, music is extremely important to me. That means, I am always a fan of activities or materials that can encourage musical development. So I had to try coming up with something of my own. And with Valentine's Day approaching, I ended up doing the sound cylinders with a Valentine's twist. This activity tray is so easy to set up. I had six heart shaped containers in three different colors. I found them at the dollar store. Inside matching colored pairs, I placed heart jewels from the dollar store, pony beads, or jingle bells. Other objects could be substituted so just use what you have on hand. The hearts end up being self correcting as the red heart would match with the other red heart, dark pink with the other dark pink, and light pink with the light pink. Please note that I did not permanently seal the hearts as I have plans to reuse these containers for other projects. Both boys loved this activity. K enjoyed shaking the hearts and listening to the sounds. He also loved to put the jingle bell hearts in his pockets and dance. He is still a little young to be discriminating the different sounds and matching them, but I was happy to see him enjoy the music hearts regardless. J, on the other hand, is at an appropriate age for matching sounds. He would shuffle the hearts around on the tray, shake one, shake another, and decide whether they matched or not. After J matched the hearts, he opened each container to check his work. He loved doing this activity! 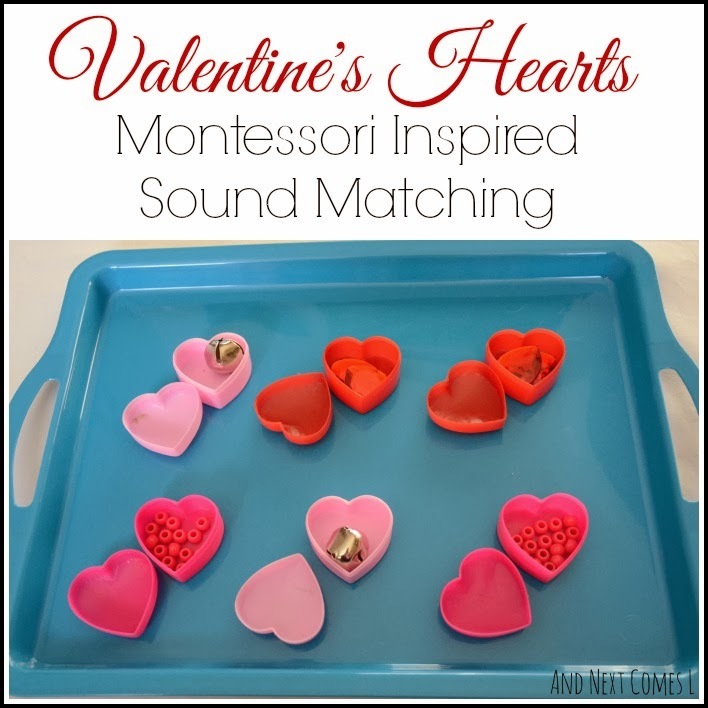 Looking for more Valentine's themed activities? You can browse all of our Valentine's Day activities here. Love how this doesn't require a lot of set up time but will be so fun for kids. Great idea! Thanks, Vicky! Minimal set up is always an added perk! What a great idea Dyan! I love the simplicity of the items used, so easy to throw together yet it provides a great sensory activity for the kids! Great post! Thanks, Lisette! It was very simple and the boys played with it very quite a few days!